The DVD contains both an edited and an unedited version. Roger Stahl is Associate Professor of Speech Communication at the University of Georgia. His work has appeared in publications such as Rhetoric and Public Affairs, Encyclopedia of Political Communication, and Critical Studies in Media Communication. His latest book, Militainment, Inc.: War, Media, and Popular Culture, was released by Routledge Press. "Whether you are a gamer or not, this documentary will surely surprise you by its exploration of the unpredictable ways politics of resistance infiltrates our media today through art, online games, and internet communications. Highly intriguing, intelligent, and entertaining, Returning Fire is a must-see for anyone interested in war, digital culture and computer games." "Violent video games are just a game - or are they? And real war is not a game -- or is it? 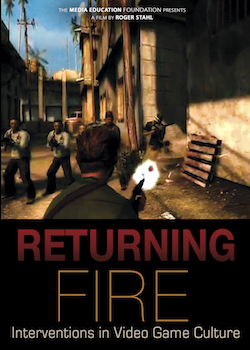 Returning Fire is an intriguing and thought-provoking documentary about the striking ambivalence of contemporary first-person shooters and virtual warfare." "Returning Fire is a must see for any anti-war activist. I think it should also be viewed by any parent considering buying their children a video game about war." "Returning Fire documents not only how closely war games are able to approximate news footage of war, but also the work of activists who work to remind players of the differences being elided. Fast-moving and to the point, Returning Fire succinctly sums up the issues and attitudes surrounding state-of-the-art wargames, and what's at stake in the debates about them. Highly recommended for classroom use, whether for video game studies, or discussions about war and activists' reaction against it." "Returning Fire shows just how far our society will go to blur the lines between war and entertainment. Concerned that our culture has lost sight of the human toll of war, Stahl builds his case on a number of startling facts about the ever-popular war video game industry. Highly recommended for academic and public libraries, Returning Fire is also an excellent teaching tool for courses in media, sociology, and psychology. The film's study guide includes outlines of key points, discussion questions, and assignment ideas." "Returning Fire is a noteworthy experiment and commentary on contemporary social attitudes about war as well as on the nature of interactive technologies and their capacity to resist as well as reinforce dominant discourses. The troubling contradictory message in the end is that we really like our war-game realism... but that we don't like it when real reality breaks in. Suitable for high school classes and college courses in cultural anthropology, anthropology of technology, anthropology of war, anthropology of protest/resistance, and American studies, as well as general audiences." "This video documentary makes an important contribution to tackling an increasingly urgent question today: how to find new ways to ask the big questions about society, our society, its goals, values and future. While bloggers have had some impact on the political process, and tweets can light fires that require some spin doctoring to bring under control, in general the digital transition has made public space disappear and morph into online virtual networks, including those of video game play. The artists featured in this documentary challenge the inhabitants of these spaces to consider them in this way, often provoking violent and hostile reactions. They show the high stakes of interrupting or restaging the routines of combat-based entertainment for long enough to provoke the realization that the players' screens open onto a virtual zone of militainment at the cost of closing off other encounters with the enemy other, the 'battlezone', the mission, and the historical reality that has informed the game design." "While Professor Stahl's own hand in this larger project can be detected in the well-thought out narration and tightly-produced visual display, there is no pre-emptive framing, and certainly none of that 'preachy-ness,' which can attend so many popular media critiques of late. Unlike, say, Michael Moore's more recent films (indeed, more like Moore's earlier work) Stahl, and his activist gamers, let the emerging culture and social spaces that have been enabled by the media environments they transgress do most of the talking. For sure, life is stranger than fiction. You just can't make this stuff up. If some of the acts (and speech acts) of resident players in these games are certainly terrifying, and while it was disquieting for some of my students to ponder the motivations of these seasoned cyber-soldiers, the final message of Roger Stahl's Returning Fire, is hardly depressing. Indeed, we find other gamers -- apparently complete strangers to the protagonists -- taking up the cause of questioning the taken-for-granted realities spawned in these virtual spaces. The notion of blowing away a small village with a daisy-cutter or even a single avatar with a semi-automatic pistol gathers renewed poignance." "This film demonstrates the power that art and artists have to make a difference in the world." "An excellent, thought-provoking piece of work. Will inspire people to consider how some games might be contributing to a developing war culture."